Much like the A-10, the Mosquito Mk.XVIII (aka Tse-tse) was an attempt to put a very large gun in a not much larger airframe. The Molins gun was a tank weapon which was fitted into the Mosquito as a potential replacement for the Hurricane IID. I've always been fascinated by the Mosquito Mk. XVIII ever since building an Airfix Mosquito as a young lad. Of course I built it with the large gun nose, but I really didn't know much about this version of the Mosquito. Well other then it was cool! 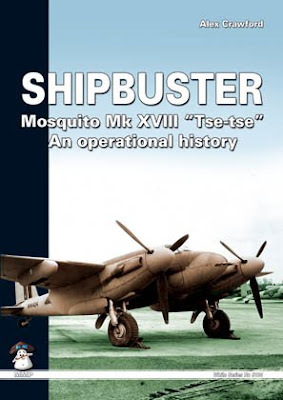 Alex Crawford's new book published by Mushroom Model Publications fills in the missing history on the Molins gun, its adaptation to the Mosquito, and its operational use as an anti-shipping weapon with Coastal Command. Quite an interesting tail, and quite well detailed in the book. Turns out it really wasn't that successful, and the RAF preferred rockets for anti-shipping operations. There are many pictures and profiles included, including profiles of some of the baddies (even some subs and boats.) I just wish they had included more photos of the Molins Mosquito. I understand that the photos included could possibly be the only photos of the Mosquito Mk. XVIII extant, but I'm a modeler and I always want more. I was also surprised to learn one of the Tse-tse Mosquitos was sent to the U.S. for tests at Pax River, and ended up being sold to the civilian market for use as a racer. I had put off purchasing this book because of the apparent high price. The first surprise upon receipt was that it wasn't one of the little booklets that MMP usually publish, but rather a normal sized large paperback. While it appears a little short at 72 pages, it is quite engrossing, covers the topic well, and in my opinion was well worth the money. You are a model stalker! I just got my TseTse book last week. I will be building it from the Airfix kit, with just a little dressing up in the cockpit, and maybe a steel tube for the molins gun.